God saw Charlie was getting tired And a cure was not to be. So he put his arms around him And whispered, come with me. With tearful eyes we watched him suffer And saw him fade away. Although we loved him dearly, We could not make him stay. A golden heart stopped beating, Hard working hands to rest. God broke our hearts to prove to us He only takes the BEST. 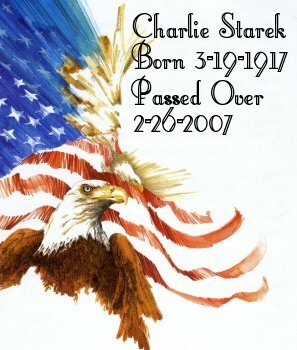 CHARLIE STAREK, age 89, an 8 year resident of Romeo, formerly from Florida, passed away on Monday, Febuary 26th, 2007 at Troy Beaumont Hospital at 12:55 A.M. Charlie was born March 19th, 1917 at home, in Manistee County, Michigan, the son of Frank and Marie (Ceting) Starek. Charlie worked as a farmer, a cook, delivered furniture, worked at a bank, and was Head of Housekeeping for a medical facility for many years. He also owned a restaurant and a hotel. He served his country in WWII in the army. He was a Master Gardener and enjoyed growing and selling vegetables at his daughters house in Washington Township. Charlie formerly belonged to the Trinity Lutheran Church in Traverse City, Michigan. And his children: Ralph of Traverse City, Charlene Hancz (Douglas Timlick) of Clio, Cheryl (Jeff) Thomas of Romeo, Juanita (Tom) Kennedy and Tammy Sloan, both of Florida. Funeral services took place on Wednesday, February 28th at 11 A.M. at the Henry Malburg Funeral Home of Romeo with Rev. Lynn Witt of the Family of Christ Lutheran Church of Imlay City officiating. Burial took place in the Romeo Cemetery. You can access Charlie's WWII Site by clicking the star. His other pages you can get to below. We are going to continue to update & add to dads pages. Thank you for visiting. The STAREK Family. When we put this site up for dad, he wanted to see if we ould find anyone associated with a friend of his, Juanita May from Copemish, Michigan... or someone in her family. Her dad was a school bus driver & a custodian at Consolidated Schools in Copemish. Juanita & dad were close friends when they were younger & she sent dad lots of letters when he was serving in the army during WWII. He still carried her picture in his wallet. If anyone knows anything about her, please let us know.